Nick Vafiadis, Global Business Lead: Polyolefins and Plastics, IHS, "Global Polyethylene: Issues and Trends"
Ajay Shah, President-Polymer & Cracker, Reliance Industries, " Overview of Polyolefin Industry - Asia/India"
Randall Wu, VP Marketing and Sales, INEOS, "Polyolefins Technology for the New Millennium"
Jinliang Qiao, Vice President, Sinopec, "Recent Development of Polyolefin Technology"
Maurits van Tol, Vice President, Borealis, "Innovation as Growth Driver - a European Perspective"
James Ray, Senior Consultant, PE and PP Market Update, ICIS, "PE and PP Market Update"
David Jackson, Senior Research Technical Leader, KC, "Polyolefins in Nonwovens: Development History and Future Needs"
The SPE International Polyolefins Conference has been in existence for 41 years and has been organized by the South Texas SPE Section in Houston, Texas. Over 80% of the South Texas Section profits from the Conference go to support students and polymer programs at 8 selected Universities that have polymer programs and SPE student chapters. The South Texas Section ( http://www.spe-stx.org ) is part of the International Society of Plastics Engineers ( http://www.4spe.org ) whose charter it to promote knowledge, technology, and the use of plastics. The Society of Plastics Engineers is home to nearly 20,000 plastics professionals in more than 70 countries around the world. 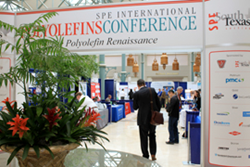 SPE is the “go to” resource for plastics technical information.